New Segafredo Coffee Shop in Town! A new Segafredo* coffee shop (and restaurant/lounge) recently popped up in the Pines, and it’s a pretty snazzy hangout, if I might say so myself. This coffee shop and restaurant has a pretty extensive menu, as well as plenty of (sectioned) seating areas, so it’s probably worth visiting more than once! With a legacy that’s 30 years old, I’m sure Segafredo’s got their recipes down right! I ordered some coffee there earlier this April, but they were still working out all the kinks in the cash registers, so long story short… I got some free (and delicious) coffee! Iced latte on the left, warm cappuccino on the right. Dining on a cruise ship is the best! Today’s adventure… the MSC Divina out of the Port of Miami! Italian-style cruising, somewhat similar to what Costa Cruises offers. I experienced a four-course (really, five-course) lunch in The Black Crab dining room. I’d ordinarily tell you about my tour, but since I’m exhausted from spending nearly a day onboard and in the sun — the sun really saps my energy — I’ll just cut to the chase and show you some pictures from my culinary adventures. 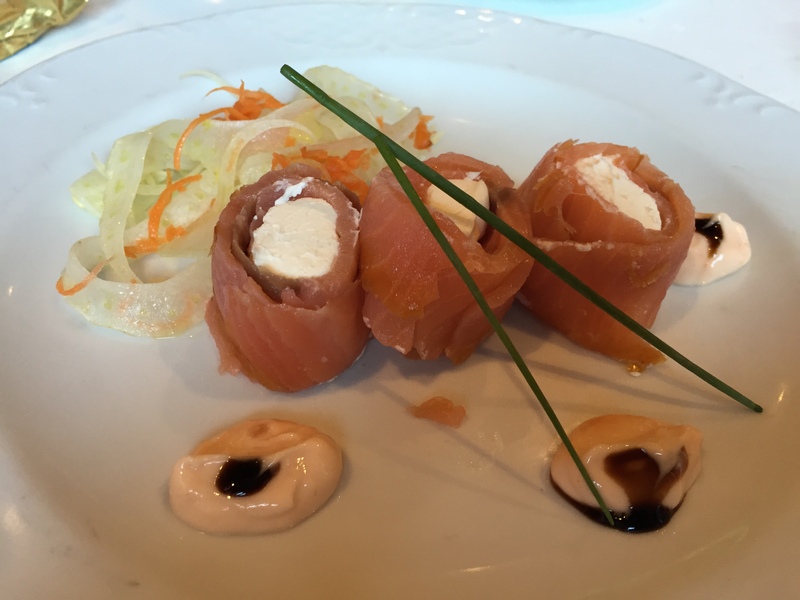 First up, the appetizer… Smoked Salmon Roll with chive cheese mousse filling. The “chive cheese” was only a little piece of chive garnish atop the plate. Also, what’s the difference between “cheese mousse” and cream cheese?! The dollops of sauce in the foreground were tasty though… kind of like Big Mac sauce. Not sure what the green veggies in the back were, as they weren’t mentioned on the menu… I’d rate this plate an okay-fine. Next up, the soup… Ca’ppuccino, cream of Porcini mushroom soup topped with frothed milk, served with a mini cumin croissant. Those of you that have been reading my blog likely know by now that food is the way to my heart. And I am always open to and appreciative of a good ethnic meal. Luckily, I got to experience an authentic piece of Italy today, onboard an authentic (and gorgeous) Italian cruise ship — the Costa Mediterranea! My morning began with a nice frothy cup of cappuccino — and great service to go along with it. So good so far. After a three-hour walking tour of the ship, I had the privilege of having lunch onboard in one of the ship’s main dining rooms.